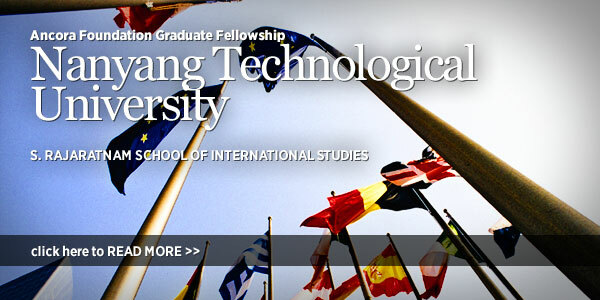 ANCORA FOUNDATION is inviting Indonesians to apply to Ancora Foundation Graduate Fellowship at the S. Rajaratnam School of International Studies, Nanyang Technological University for 2012-2013 academic year. One scholarship is offered each year for a one-year master’s program at the S. Rajaratnam School of International Studies (RSIS) at the Nanyang Technological University in Singapore. More information about the program and the application process can be found in our website www.ancorafoundation.com, specifically on the Programs section of the website. (http://ancorafoundation.com/programs/ntu/). In brief, please submit our scholarship application form to us while applying to the university. Please feel free to disseminate the above information to your friends and associates. Demikian kami sampaikan tentang [beasiswa] [info] ANCORA FOUNDATION Graduate Fellowship – S. Rajaratnam School of International Studies-Nanyang Technological University semoga informasi tentang [beasiswa] [info] ANCORA FOUNDATION Graduate Fellowship – S. Rajaratnam School of International Studies-Nanyang Technological University ini bermanfaat.